Are you having problems with the behavior of your Rottweiler and wondering if he is a dominant dog? Perhaps you have been told that many of his unhelpful behavior types are because he wants to take over the family pack? In reality, the term dominance can be highly overused particularly when describing dogs and their behavior. 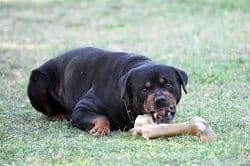 So read on to learn more about dominance in dogs and why it probably does not automatically describe your own Rottweiler. Is My Rottweiler a Dominant Dog? First we must understand what dominance really means. True dominant behavior in dogs is very rare, as are truly dominant dogs. Most of the acts which are described as dominant, by some dog trainers, are simply behavior types that the dog has learned to carry out based on how his owner has reacted to them. Anxiety or fear can also cause behavior which seems aggressive, the same acts that some trainers label to be dominance. Dominance related dog training is based on a study long ago which involved captive wolves. It is not scientifically proven and certainly not the best way to understand the modern day Rottweiler. You do not need to establish dominance over your Rottweiler, you simply need to understand and communicate with him in a language that he understands. Surprisingly the usual rules for dominance training will actually cause confusion in your dog’s mind, because he is not a captive wolf and neither are you. If the behaviour of your dog is challenging then it is vitally important that you understand exactly why he is doing it. By learning about canine communication signals, calming signals and signs of stress or anxiety you can get a really good idea of why your dog does what he does. I would like you to look at yourself when you think that your dog’s behavior shows dominance. As loving dog owners we often teach a dog to behave in a certain way without even knowing it. We fuss them when they jump up or fail to train them properly whilst on the leash. If you have a Rottweiler that guards possessions or even a space on the sofa then ask yourself, have you ever backed away from his guarding behavior? If so then you have taught him that it works, that by behaving this way he gets to keep the resource for longer. This type of guarding is all too often described as the act of a dominant dog leaving the dog completely misunderstood, when really the dog is only doing what he has learned to, in his life so far.